The other day someone asked me what bagels varieties i made. I went through them but slowly as i knew i would probably forget one or two if i tried to go fast. Not quick enough for my interlocutor who tried to remind me ‘poppy seed, sesame seed, plain…’ she insisted. But, i explained, only one of these is true: plain. 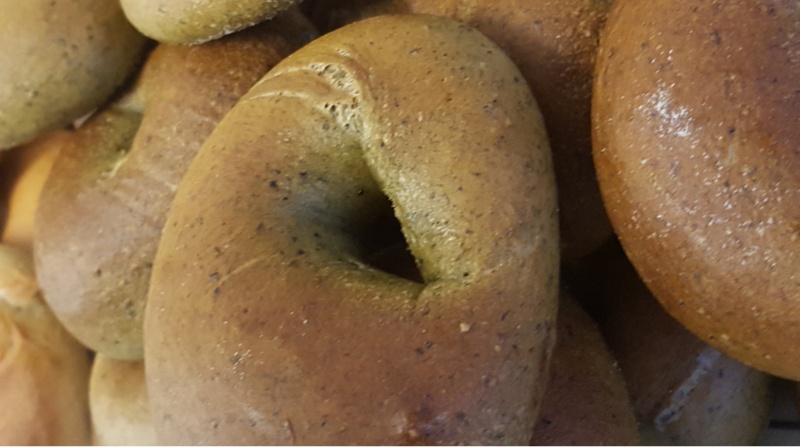 The Tower of Bagel seeded plain has a mix of flax poppy and sesame seed. ‘Do you do rye’, she asked. ‘I like rye’ she said ‘with caraway’. Well i have done but it is not a staple. Just as i have done a rainbow bagel. What about a marbled bagel. Nope. What about a sourdough bagel. Nope. What about a gluten free bagel. Not yet. The possibilities are endless, which is one of things i really like. And most especially I like also doing seasonal varieties like wild garlic in the spring (see to the right) and nasturtium (pictured above) in the summer. The key thing whatever the variety, is that the bagels are boiled in a kettle, and the end product is a chewy bite, close texture.